Harry and Ralph’s parents are looking forward to the first quiet Sunday that they have enjoyed in a while; that is until Aunt Susan phones. Nobody refuses the indomitable Aunt Susan who is probably the bossiest woman in the world. Before they realise what has happened, the whole family has agreed to help run the Great Toadpool Show. It turns out to be a simple matter of stilt walking, fortune telling, unicycle riding and trapeze swinging – so what could possibly go wrong? 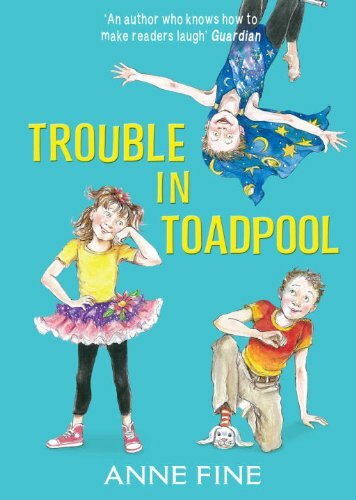 This latest rip-roaring story from Anne Fine will have young readers laughing aloud as they discover just how much can go wrong in Aunt Susan’s quest to provide unforgettable entertainment. Her hopes appear to be dashed as chaos spreads rapidly through the Show at the hands of her family. Even her own daughter Titania is affected by the Mountfield Family Curse which Great Granny once cast using backwards voodoo. All seems lost until Ralph, Harry and Dad unwittingly save the day. Aunt Susan is invited to join the Ladies’ Charity Guild, Titania’s gift for design is discovered and Ralph gets the spark spitting wind-up nun that he wants in spite of Great Granny’s malevolent guarding of the Lucky Dip. Best of all, he breaks the Family Curse and Titania regains her dancing and singing skills. This is comic writing at its best from an established and successful children’s author. The narrative is fast-paced, the illustrations are a witty enhancement of the text and the plot is a droll parody of normal family life. It would be suitable for independent readers or for reading aloud.